- برنامج سرقة كود الويفي بدون انترنت. كشف رمز ويفي و كلمة سر واي فاي هو تطبيق يساعدك على اكتشاف كلمات سر نقاط الواي فاي. هذا التطبيق يسمح لك للحصول على فرصة والقدرة على استرجاع كلمة السر لشبكة الواي فاي لديك التي سبق الاتصال بها. يمكنك بعد ذلك الاستفادة منه بنسخه، أوحفظه في بطاقة SD، أو مشاركتها مع صديقك. فإنه لا يستخدم MAC / عنوان SSID للاستدلال على كلمة المرور. ببساطة يقرأ من الجهاز نفسه. Do you always search for a breakthrough Aloeva program revealed a password revealed code and Levi? - theft Aloeva code program without the Internet. Detection code meets and password Wi-Fi is an application that helps you discover the secret of Wi-Fi access points words. 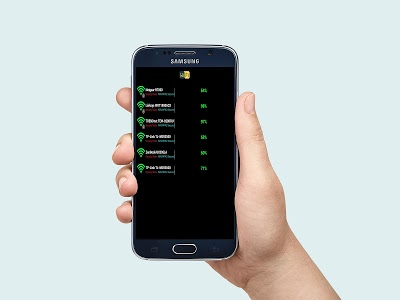 This application allows you to get the opportunity and the ability to retrieve the password for the Wi-Fi network you have previously contacted. You can then take advantage of it, copy, Oouhfezh SD card, or share with a friend. It does not use the MAC / SSID title to deduce the password. Simply read from the device itself. Similar to "كشف كود الويفي Simulator"